The Estate of Caldecote has had a rich, turbulent and sometimes illustrious past. It was registered in the Domesday Survey of 1086 as being in the ownership of the Bishop of Chester when it was valued at the princely sum of 60 shillings. There followed a long period of wrangling over its ownership and either through litigation or through the powers vested in some of the more tyrannical of our Monarchs, the Manor passed through the hands of a series of owners including King Henry VIII, Edward VI and Charles II. It was during the reign of Charles I that the original Hall, which was originally built as a fortified Manor went through one of its most dramatic periods. At this time, the Estate was owned by Colonel William Purefoy, the famous Puritan leader and zealous Parliamentarian. As such, he was a wanted man and in August of 1642, the Princes Rupert and Maurice, nephews of King Charles, laid siege to Caldecote Hall in search of their enemy. Knowing of their imminent arrival William was hidden away in the Hop Garden whilst his wife, son-in-law, 3 maids and 8 servants staged a defence of the Manor. The Princes were supported by a marauding troop of 500 soldiers - but despite the odds, the brave defenders managed to hold out for a considerable time by melting down pewter goblets and cutlery to form bullets for their muskets. They killed 3 officers and 15 soldiers before the Prince's finally secured their surrender by setting fire to the Hall. Their bravery earnt them their lives as Prince Rupert spared them for their gallant defence - but the Hall was damaged and had to be rebuilt. The original manor door now forms the entrance to the Church on the Estate - and still bears the bullet holes from the seige of 1624. In its more recent history, the Hall was acquired as a family home in the late 19th Century. The new owner, Captain Henry Leigh Townshend, acquired the original Estate which covered over 1200 acres of land and proceeded to build the Hall we see today at a cost of £80,000 in 1880. He was a self-made millionaire of more humble origins who wished to live the life of - and be accepted by - the landed gentry. The Hall bears the marks of the Townshend family motto, "Patience Overcomes Evil" and was designed to reflect their desire to live in luxury. The Townshend family is well known historically and Peter Townshend, famed for his scandalous relationship with Princess Margaret in the 50's, is a descendant. The magnificent Minstrels Gallery that overlooks the main hall is a superb example of the grand style and evokes a sense of decadence and opulence that characterises the Caldote Hall of that era. Turbulent times - break-up, institutionalisation and fire.. Despite Captain Townshend's wealth and his efforts to ingratiate himself amongst those he wished to consider his peers, the family was never fully accepted amongst the gentry and he is reputed to have died an unhappy man. His descendants decided to break up and sell off the estate and in 1924 the original 1200 acres was sold at auction in 28 lots, including the 35 acres on which the Hall stands today. This main plot was purchased at that time by The Church of England Temperance Society who converted it into a Retreat for treatment of "Neurasthenia and other Nervous Ailments resulting from Mental Strain, Drugs and Alcohol Addiction." The original visitors book of this "Mens Retreat for the treatment of Alcoholists, the Depressed and Brain Weary" shows a stream of wealthy vistors who enjoyed the restorative pleasures of the house and grounds as well as the expert treatment of its resident physicians. 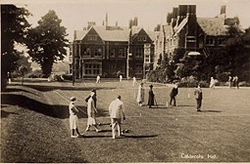 One quote stated that: "At Caldecote Hall all social classes are received and experience shows that they mix readily and freely together, working and indulging in sporting competitions in a spirit of real comradeship." 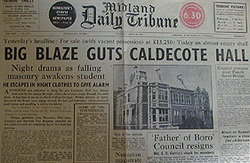 The Hall was purchased in 1953 by Commander Cyril Colbourne, a property developer, who elected to rent out a main portion of the building as a school, then known as St Chad's. By 1955, the school principle owed rent arrears and was being pursued by the Commander for payment. It was in this circumstance that Colbourne decided to place the Hall back on the market. On Wednesday 27th April 1955, the local headlines read that Caldecote Hall was for sale at a price of £15,250 - the following day, the same newspapers carried the story of a terrible fire sweeping through parts of the main hall, destroying its roof and severely damaging many of its rooms. The debt-laden school principal disappeared and was never heard of again. Unable to pay for restoration work, Commander Colbourne sealed off the damaged area and lived out his life in an apartment at the front of the Hall.